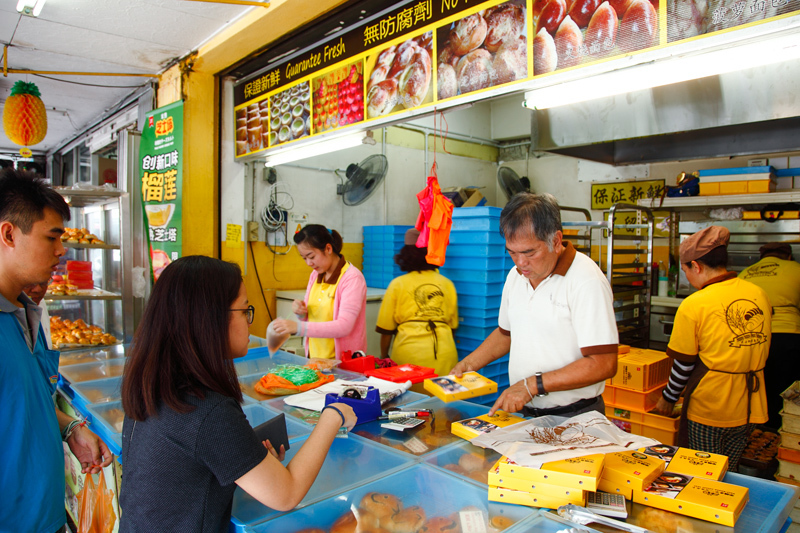 Also, they are not using just any durian but Musang King! Based on the amount of social media attention they gained, safe to say it was a brilliant move and they are now reaping the benefits. 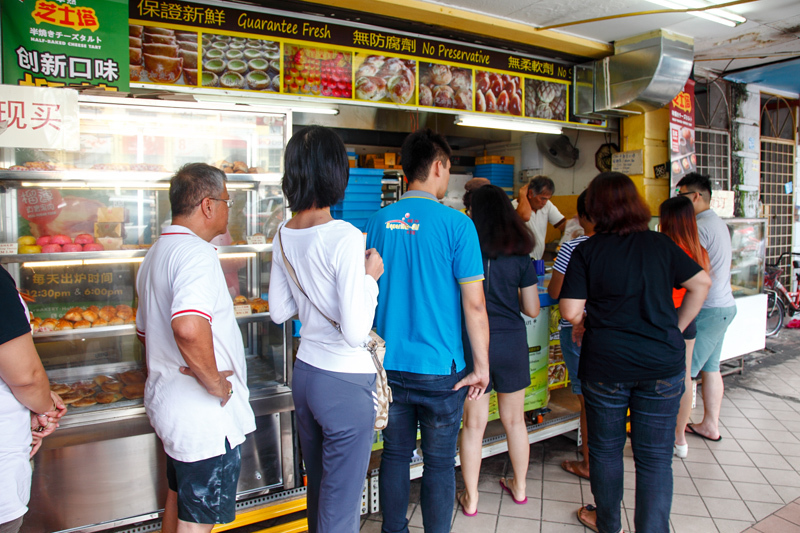 Although there was already a queue when we reached the bakery, waiting time was short as we got our tarts within 10 minutes. From what I saw, not everyone in the queue was there to buy the cheese tarts, as some of them were buying traditional pastries instead. I am not sure if there’s a minimum purchase, but you will only get a box if you buy 6 pcs and above. 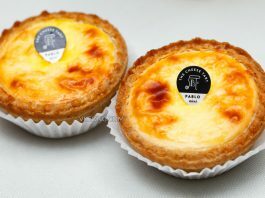 We took a mix of normal cheese tarts and durian cheese tarts which cost RM23 (a bit of discount) in total. The tarts were still warm and fragant when we got them. 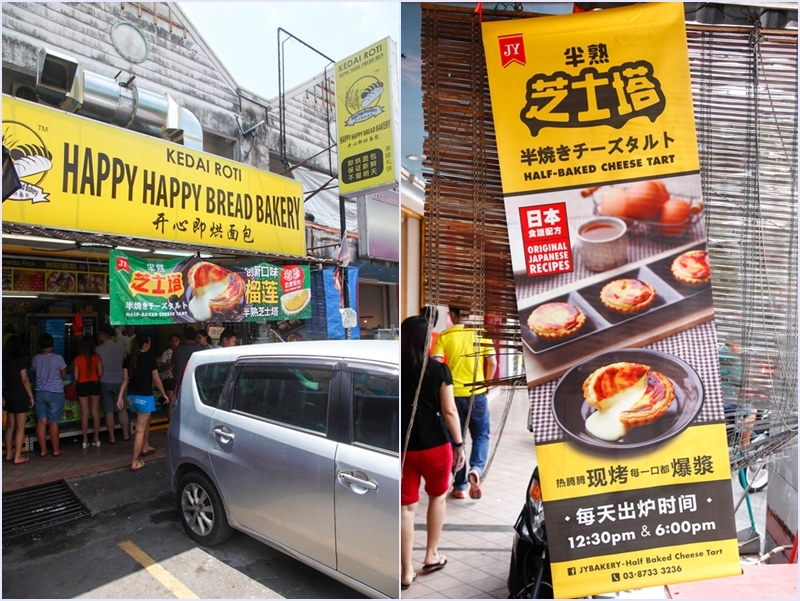 With everything considered, Happy Happy’s cheese tarts @ RM3.80/pc would be considered cheap if you compare it with Tokyo Secret‘s (TS) RM7.90/pc. 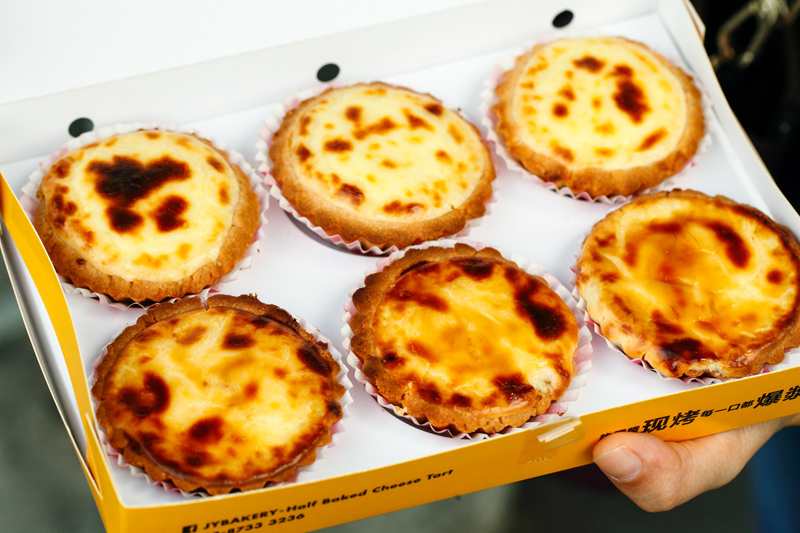 Size wise they are pretty much the same but TS’ cheese tarts are deeper and undeniably filled with more cheese filling. 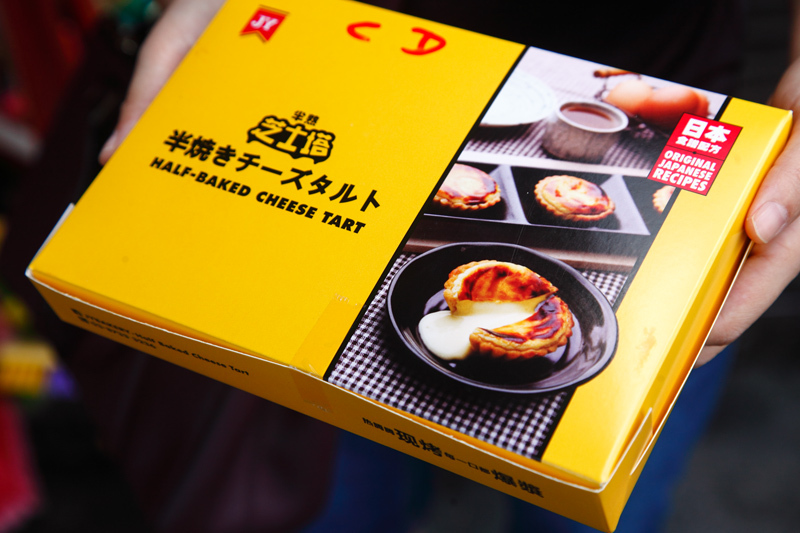 Besides, Happy Happy’s cheese tart feels fragile and crack easily. So you need to be careful or they would break into pieces – even just trying to lift them up from the box. Based on that I’d say their pastry kung fu is behind TS’, which is why you are paying RM4 less here. 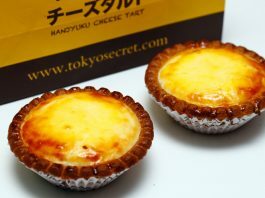 Having said that, the tart’s crust is still crumbly delicious with a sandy texture, while the cheese filling is soft and gooey and more overflowing – even more than TS’ but not as intense in flavor. As for the durian cheese tart, it’s nice and good enough to justify its RM4.50 price tag. 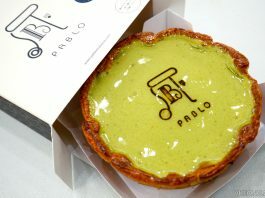 You can see the amount of Musang King durian flesh at the bottom of the tart which occupies more than half of the filling. 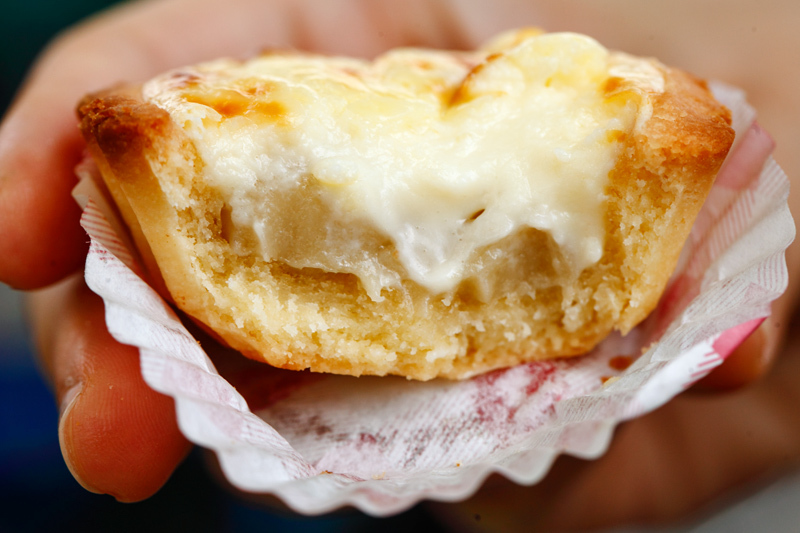 However, if I return again I’d stick to the original cheese tarts. 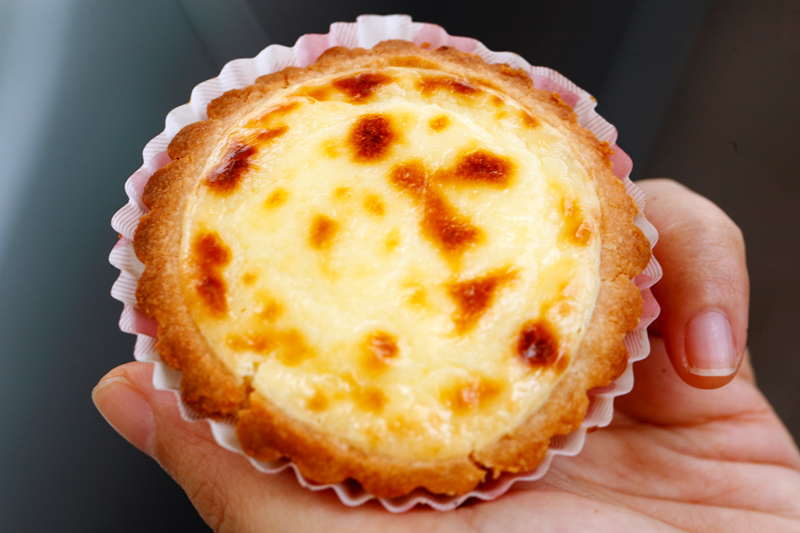 For those who plan to come, do note that their half-baked cheese tarts are baked in 2 batches a day and only ready for purchase from 12.30pm and 6.30pm onwards. So plan your journey carefully to avoid disappointments. You may also call or Whatsapp them ahead for reservation.